Everybody wants to be happy. Unfortunately, relatively few achieve bliss. 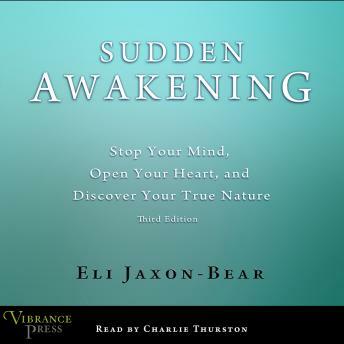 Eli Jaxon-Bear explores how it is possible to achieve lives filled with gratitude and love. True happiness and meaning are achieved, he asserts, when we wake up, stop our minds, and open our hearts. It is then that we discover our true selves; our core identity that is part of the ultimate living intelligence of the universe; our true source. Like Gangaji, Jaxon-Bear uses a method of self-investigation called 'self-inquiry.' In the light of direct self-inquiry, limitations that once seemed to define ourselves are discovered to be more like transparent lines drawn on water. They exist only on the surface of consciousness in one's imagination. When these illusions of mind are clearly exposed, true limitless being reveals itself. This is a book that will appeal to those who are fans of Gangaji, Byron Katie, and Eckhart Tolle. It is an articulate and helpful expression of a path to fulfillment for those wrestling with questions of identity and meaning.